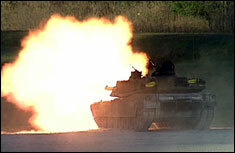 M1 Abrams main battle tanks are the only true tank type in the United States Army and United States Marine Corps. They have gone through several upgrades, and were first used in combat in the Gulf War, and were successful there and in continuing operations. As the U.S. Army reorganized, they, along with the M2 Bradley infantry fighting vehicle, will remain the principal weapons of the heavy brigade combat team. In some respects, the M1 Abrams make no compromises with the traditional three tradeoffs in tank design: protection, weapons, and speed. 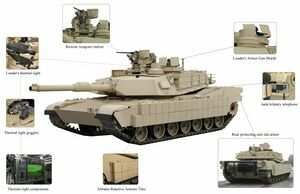 Not in the classic list, but also extensive, are electronic sensors and communications, where the Abrams is also has a comprehensive suite of equipment. These result in the tank being heavy and large, often too heavy for older bridges and too wide for streets of old city design. In part, the Stryker (armored fighting vehicle) series is an intermediate between the Abrams and Bradley, and lighly armored HMMWVs, to operate in urban environments. M1A2: improved electronics, including a thermal viewer and weapon station. 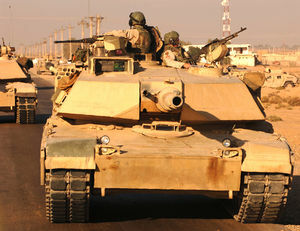 The Abrams chassis has been used for other equipment used in armored operations, such as the M104 Wolverine mobile bridge and the Assault Breacher Vehicle. In addition to the U.S., they are operated by Australia, Egypt, Kuwait, Saudi Arabia, and Iraq. Their frontal armor appears to withstand direct hits from any tank gun and most antitank missiles in the world, although their thinner top and side armor has been punctured, usually with minimal damage. Complementing the armor is an automatic fire extinguishing system, a "blowout" ammunition compartment so that an explosion there does not go into the crew compartment, and other features. The latest version is air-conditioned, and protected against weapons of mass destruction contamination. An additional set of enhancements, the Tank Urban Survival Kit, includes a number of protective measures for crew members. While the original version had an 105mm gun, all versions that have gone into combat have a 120mm smoothbore main gun, manufactured under license from Rheinmetall of Germany. It originally was limited to two types of ammunition, the armor-piercing, fin-stabilized, discarding-sabot (APFSDS) round used against tanks or other heavily armored target, and a shaped-charge high explosive anti-tank used against more lightly armored targets, and, originally, against all other targets. The ammunition limitation was not inherent to the gun, but to its original ballistic fire control computer, which only could store information on two types of shell. A updated computer has more storage, so the gun can also fire blast-fragmentation, canister antipersonnel,and concrete penetrating. The limitation now tends to be in the number of shells for which the tank has storage. Additional weapons include a M240C 7.62mm machine guns, with one mounted coaxially with the main gun, so pointing the turret points the machine gun. There is another M240C at the loader's hatch and a .50 caliber M2 machine gun mounted on the commanders cupola and pointed and fired remotely from inside by the commander. The main armor is a derivative of the British Chobham armor, which is a "sandwich" of several materials, each optimized against a certain type of armor-piercing weapon, and mutually reinforcing. The exact composition is classified, but is generally believed to contain steel armor plate, hard ceramic, dense depleted uranium, and possibly some fiber-resin composite materials. Especially on the most exposed areas, the armor slopes, to have the maximum effectiveness of deflecting rather than absorbing the effect of hits. embedded diagnostic system and improved fire control systems. The tank's top speed is limited by an engine speed limiter, not by the engine, a 1,500 hp turbine. To save wear on tank treads, the Abrams can be carried over roads by the Heavy Equipment Transporter System (HETS) ultra-heavy truck.